Lightflame is a human of Royal descent. Although her father is a half elf, she herself appears to be purely human. Her home country was taken over while she was an infant by an evil emperor amongst others and she was raised by another country's royal family. Her intent is to regain her country and for her people to know freedom again. 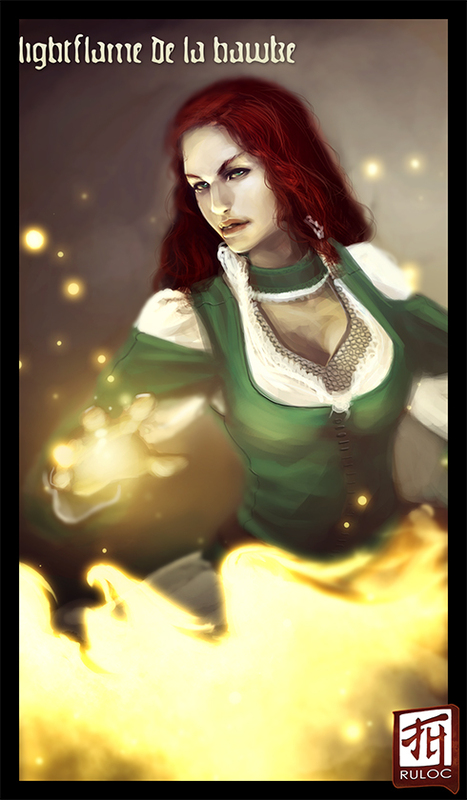 She is a Magus with an affinity for flame. Although she has a heirloom long sword, her magic is her primary focus. She has worked out a way so that all her distance fire spells (like fireball) take a hawk shape. It is her signature. Lightflame wears her elven chain beneath fine robes. She tends to wear colors that complement her flaming hair and amythest eyes. She is small in stature (5'2" around 95-100 lbs), but stronger than she looks. Her personality is quiet and relaxed. She has few strong bonds, just her foster brother and a friend of his, as her concern is to free as many countries as possible besides her own and to make strong allies for her people. She has an amethyst ring on one hand.